Lead in: Morgan Johnston, manager of corporate communications and social media strategist at JetBlue Airways, explained how social listening leads to “quality engagements” with customers. 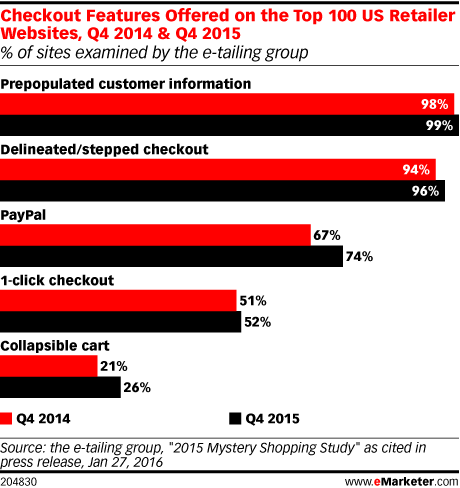 Most retailers know the checkout features they want to offer, like pre-populated customer information. Aside from a few adding PayPal to their website, many are not making changes to other areas, like adding one-click checkout. TV viewing remains a regular pastime for most residents in Germany. Nine out of 10 adult internet users in the country watched television at least once per week in October 2015, according to the Office of Communications (Ofcom) – UK. Lizzie Schreier, director of web and social engagement at Allstate, discusses the insurance provider's three-pronged approach to social listening. Marcy Cohen, MasterCard's vice president of digital communications, explains how the global payment provider uses social listening to find actionable engagements. Nearly half of internet users in Sweden are planning to celebrate Valentine’s Day, according to a February 2016 survey by Svensk Handel. Of those who intend to do so, 44% will buy a gift for their partner, while 37% plan to stay in and cook a nice dinner. During the Super Bowl 50, viewers were glued to their TV sets—with their mobile devices nearby. A February 2016 survey found that mobile accounted for the largest share of searches related to Super Bowl ads. The market for smart watches may be heating up in Latin America, according to 2015 research. They’re the most desired wearable device in several markets, ahead of fitness bands. Facebook is king of the social networks among younger adults who use the mobile internet in Indonesia, but Instagram is not far behind, according to January research. In France, broadcast TV remains almost universally popular. But many consumers also watch TV on other devices and platforms, including PCs, tablets and mobile phones. 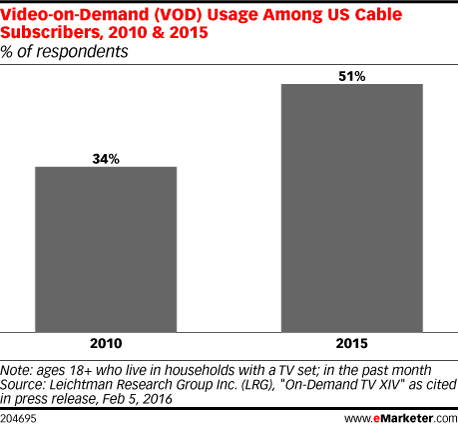 Conversely, much digital video content can now be viewed on a TV set. 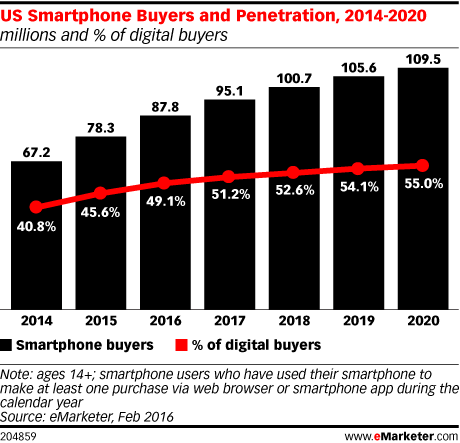 Next year will mark a milestone for US ecommerce, as more than half of digital buyers in the country will use a smartphone to complete a purchase during 2017. According to eMarketer’s latest forecast, 95.1 million Americans ages 14 and older, or 51.2% of digital buyers, will make at least one purchase via a smartphone. The virtual reality (VR) market is skyrocketing in China, according to 2016 estimates. Revenues nearly quadrupled in 2015, and growth has not yet peaked. Ashley Mainz, social business manager at Southwest Airlines, details how the company's Listening Center provides insights for the entire organization. Consumers use their smartphones a great deal when shopping, and according to November 2015 research, receiving real-time promotions is one of top smartphone retail services they desire. Social media usage is on the rise in China and reaching an ever-greater share of the population, according to 2015 data. Social is gaining ground among all age groups in the country. Matt Gentile, global director of social media at Century 21 Real Estate, explains how the company uses social listening to expand its international franchise network and help local sellers find potential buyers. Consumers spend a lot on Valentine’s Day, and this year is no exception. According to 2016 research, the largest shares of gift spending will be on evenings out and jewelry. Usage of wearables, like smart watches, will grow by nearly two-thirds this year, per an eMarketer forecast. Still, cost is holding many consumers back from purchasing a device. Data from a February 2016 YuMe report reveals that 69% of US internet users find TV news to be the most effective political marketing channel.